“The event is two days because we had such a great turnout last year,” Blissfield DDA/Main Street Program director Patricia Rayl said. Those attending Railroad Days will be able to enjoy the fruits of the labor and passion of local model railroad collectors who will share their collections with them in several of the downtown area businesses where trains will be set up as well experience an actual train ride. available. The village also has an historic depot on Lane Street that houses the DDA/Main Street office and will be open during the event. Blissfield also boasts one of the larger area model railroad clubs that will be pen and running 11 model trains on more than 1500 feet of track. The event began taking shape less than two years ago when local businessman and resident, Frank Baker, whose model train collection will be on display in his home both days, planted the seed with the DDA/Main Street Program. The family-friendly event has several different events that run both Saturday and Sunday, April 20 and 21, as well as a few happenings that occur on just one day of the event. Access to most of the events can be made with the $5 purchase of a punch ticket that can be used for admission into the special events. All of the locations, including the businesses with model trains, are listed on the ticket. Volunteers will be at each location to punch the ticket. “It helps everyone know what they have seen, so they don’t miss anything,” Blissfield Railroad Days co-chairperson, Joe Watt said. The ticket will allow access to the special events such as the model railroad tours in the three area homes, to one ride each way on the Adrian and Blissfield, rides on the Lenawee Voiture 40 & 8 Trolley, the events at the American Legion and the Blissfield Model Railroad Club. Tickets will also be punched at the displays offered by local area merchants as well as the downtown mini-park and the Lane Street Historic Depot. This year the ticket will include the fee to ride the A & B Railroad rather than having people purchase a separate ticket. Brenda Rice from Adrian and Blissfield Railroad who serves on the Railroad Days committee as well, said incorporating the fee into the overall price of the ticket would hopefully keep lines for those waiting to board the train at a minimum. Tickets can be turned in after all of the sites are visited at the Lane Street Historic Depot for a chance to win a gift basket. Winners do not need to be present to win, Rayl said. The event runs from 10 a.m. to 4 p.m. both days but certain events have more specific schedules. The Lenawee Voiture 40 & 8 trolley will have three pickup and drop off locations to help people get from the downtown to events on the west side of town as will a ride on the A & B Railroad. 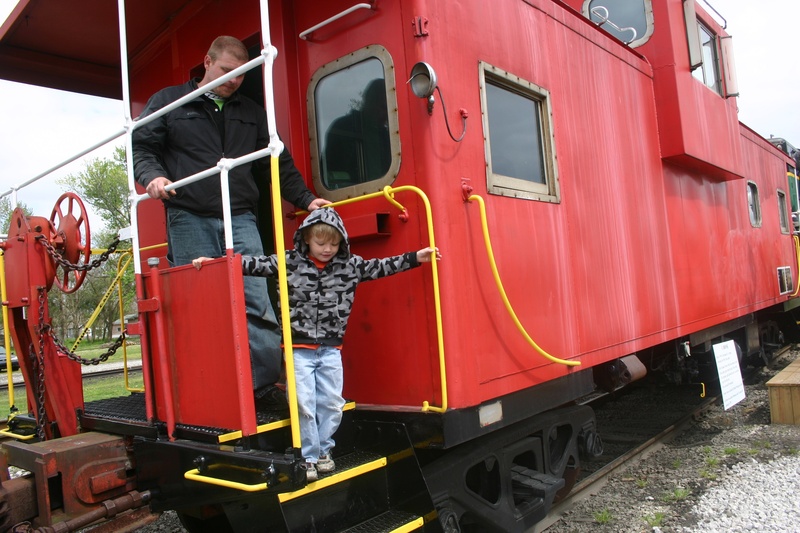 Highlights: • Adrian and Blissfield Railroad Train Rides : Trains run from 10 a.m. to 2 p.m. Saturday and noon to 4 p.m. Sunday. Riders can board the train once at both the east and west depots. Trains will stop running at the scheduled times so anyone riding the train may want to arrive at the depot at least 15 minutes before the trains are scheduled to stop running to guarantee a ride. • Adrian and Blissfield Railroad Display: The railroad will have a static display of a vintage locomotive and a caboose near the East Depot at the main village location of the Adrian and Blissfield Railroad. Both pieces will be open to tour and explore. • Blissfield Model Railroad Club: The club on East Adrian Street/U.S. 223 will have its model railroads on display with trains running from 10 a.m. to 4 p.m. on Saturday and Sunday. • Downtown Mini-Park garden railroad: A larger-scale model train will be set up in the mini-park from 10 a.m. to 4 p.m. Saturday and noon-4 p.m. Sunday. On Sunday, Engineer Dan will be available at the mini-park for photographs from 1-4 p.m.
• Blissfield American Legion Events. Saturday the Legion will be the site of more displays of at least four modular railroads from various clubs from 10 a.m. to 4 p.m. Sunday everyone can buy, sell or swap everything they need for the model railroad. • Operation Lifesaver: This group that educates on railroad safety will be at the Lane Street Depot both Saturday and Sunday. • At least half a dozen downtown merchants will have different model train exhibits in their businesses. These businesses are located on the map as well as the Railroad Days punch ticket. Some of these trains include a 100-year-old model train and a Thomas the Tank Engine Train. • Lenawee County Voiture Locale 997 40 & 8 Chateau Trolley will also be here both days. The trolley will pick people up at the parking lot at Pearl and Jefferson streets, the west depot and at the American Legion Hall to shuttle people to the events on the west side of the village. The homes of Frank Baker, Clem Krzeczkowski and Doug Tagsold will also be open to show their extensive model railroad collections. For updates, please visit www.BlissfieldMainStreet.com . newspaper insert with more information on the event – including a map – is published the week of April 10-11 in The Advance, Blissfield; The Daily Telegram, Adrian; State Line Observer, Morenci; The Dundee Independent; The Tecumseh Herald; and The Monroe Guardian.